Ghosts, witches and goblins, oh my! 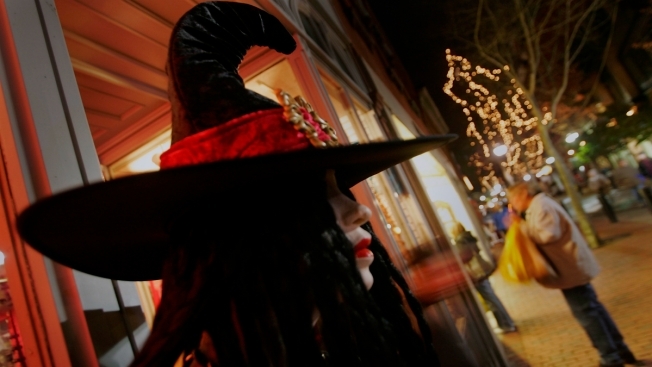 We've got you covered with a full list of Halloween events taking place across New England. Oct. 1 - Oct. 31: A festive celebration of Halloween and fall in New England with events taking place in Salem, Massachusetts. Sept. 26 - Oct. 31: Walkaround characters, indoor and outdoors haunts, rides and more in Salem, New Hampshire. Sept. 25 - Nov. 7: Haunted houses, haunted hayrides, and more in Litchfield, New Hampshire. Oct. 2 - Oct. 31: Haunted hayride, nightmare mansion, Jack O' Lantern Jamboree and more in Westford, Massachusetts. Now through Oct. 31: Boston Frightseeing Tour in Boston, Massachusetts. Oct. 1 - Nov. 1: A nighttime display of 5,000 illuminated jack-o-lanterns at Roger Williams Park Zoo in Providence, Rhode Island. Oct. 22 - Oct. 31: Interactive haunted houses. Oct. 2 - Oct. 31: Zombie paintball, haunted farm and a flashlight maze in Danvers, Massachusetts. Now through Nov. 14: Legends and history of haunted Portland, Maine. Oct. 17 - Oct. 31: All things creepy that are water related in Bucksport, Maine. Oct. 2 - Oct. 31: Help needed to eliminate the zombie threat in Agawam, Massachusetts. Oct. 17 - Oct. 18: Children throughout New England are invited to trick-or-treat among the animals in Stoneham, Massachusetts. Oct. 24 - Oct. 25: Children throughout New England are invited to trick-or-treat among the animals in Boston, Massachusetts. Oct. 16 - Oct. 31: This frightening attraction in Lee, New Hampshire, won ABC's Great American Fright Fight last year and donated the money to the Cocheco Valley Humane Society. Oct. 2 - Oct. 31: Castle of Corpses, Psycho Circus and more in Nashua, New Hampshire. Now through Oct. 31: Guided haunted tour in Abington, Massachusetts. Oct. 24: Listen to tales of some very strange characters in Beverly, Massachusetts. Oct. 31: All-inclusive celebration in Portsmouth, New Hampshire. Oct. 2 - Oct. 24: World class adventure corn maze in Sterling, Massachusetts. Oct. 3 - Oct. 24: Pumpkin painting, games and more in Sterling, Massachusetts. Oct. 10: Royal Frog Ballet is a free-wheeling, high spirited art performance collective, bringing their slightly surreal yet family-friendly Halloween hauntings to Naumkeag's gardens in Stockbridge, Massachusetts. Oct. 22: Pumpkins and games in the gardens! Kids encouraged to wear their Halloween garb at this event in New Bedford, Massachusetts. Oct. 30: Mr. Crane's dear friend Frederic Abbott is hosting a cocktail party at Castle Hill and you are invited to be his guest. Don your party attire and come for a drink. Can you solve the mystery that ensues? Explore the Great House in teams looking for clues to figure out who did it, with what, and where. Prizes will be awarded to the winning team. Advance reservations required. Guests will be assigned to teams upon their arrival. Event takes place in Ipswich, Massachusetts. Oct. 20: Bring a small, carved pumpkin and watch it float down the Neponset River in a lighted procession. Bring a picnic and break out your Halloween costume for this fun family event! Please note: This event relies on tide and sunset times; takes place in Boston, Massahcusetts. Oct. 2 - Oct. 31: For lovers of Halloween in Framingham, Massahcusetts. Oct. 31: Costumes, cars and candy at the Tri-State Speedway in Dudley, Massachusetts. Oct. 2 - Oct. 3: Fantasy performance that features the audience as heroes in Monson, Massachusetts. Oct. 2 - Oct. 31: A haunted hayride and a spooky walk in Auburn, Massachusetts. Oct. 2 - Oct. 31: The haunted tunnel in Pawtucket, Rhode Island, is not recommended for children under 10. Oct. 3 - Nov. 1: Take a haunted hayride at McCray's Fram in South Hadley, Massachusetts, and then get some frights in at the haunted manor. Oct. 3 - Oct. 31: Can your make it through this haunted house in Canton, Massachusetts? It features over 50 live actors, animatronics, and top tech to deliver scares! Oct. 23 - Oct. 24: Haunted hayride in Grafton, Massachusetts. Oct. 24 - Oct. 31: The devilishly delightful musical comedy in Franklin, Massachusetts. Sept. 25 - Oct. 30: Ghoulie Manor is located by the Cinema at the Silver City Galleria Mall in Taunton, Massachusetts. Oct. 11 - Nov. 1: Haunted hayride and outdoor walking trail in East Falmouth, Massachusetts. Oct. 16 - Oct. 30: Haunted events at Hammond Castle Museum in Gloucester, Massachusetts. Oct. 2 - Oct. 24: The Millbury Youth Camp Inc. presents 12 events to get your scare on in Millbury, Massachusetts. Oct. 2 - Oct. 10: Corn maze in Danville, Vermont. Sept. 25 - Oct. 31: The haunted playground in North Conway, New Hampshire. Oct. 24: 12th Annual Great Pumpkin Fest at the EcoTarium in Worcester, Massachusetts. Oct. 2 - Oct. 31: The Haunted Graveyard at Lake Compounce opens for its 25th season on October 2nd, 2015 and is celebrating this momentous year by hosting its first ever Cosplay Event in Bristol, Connecticut. Oct. 24: Oyster River High School in Durham, New Hampshire. Oct. 18: "Nightmare on Elm Street" Walk Against Animal Cruelty in Enfield, Connecticut. Oct. 1 - Oct. 31: Train rides, kids ride and more in Burlington, Vermont. Oct. 23 - Oct. 31: Walk the haunted halls in Somerville, Massachusetts -- if you dare. Sept. 13 - Oct. 26: Corn maze, duck races and more in Ludlow, Massachusetts. Oct. 9 - Oct. 31: If you dare...in Guilford, Vermont. Oct. 17: Pumpkins, music, storytelling and magic in Norton, Massachusetts. Oct. 31: Spooky stories, tricks and treats in Boston, Massachusetts. Oct. 30: All dogs and their owners are invited to the Boston, Massachusetts, event. Oct. 24: Pumpkin carving, animals and more in Norwell, Massachusetts. Oct. 29: Participants will be guided through a painting - lights out, black lights on - while socializing with friends and meeting new ones in Malden, Massachusetts. Oct. 31: The event will be a next level Halloween experience with costumed performers, themed decor and incredible sound, lights and special effects in Mashantucket, Connecticut.